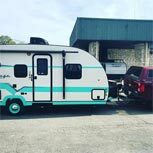 Princess Craft offers a way for you to purchase this trailer without traveling to our location! Delivery is available for some trailers, or you can set an appointment to pick it up at the dealership. Whether in person or online, we are always ready to help you during the entire process. 1 Click Buy It Now. 2 Place a deposit on your trailer. 3 Request pick up or delivery date. 4 Want to finance? Complete the app online!